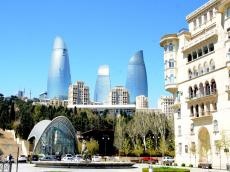 Baku will enjoy one of the hottest spring days as temperatures will rise to 15-17 Celsius. Changeable cloudy and dry weather is forecast for March 7, the Ministry of Ecology and Natural Resources reported. Drizzle predicted in some places at night and in the morning. South wind will waft. The temperature will be +3-6?C at night, +10-15?C in daytime in Absheron peninsula, +4-6?C at night, +13-17?C in the second half of a day. Relative humidity will be 75-85 at night, 55-60% in the afternoon. In the regions of Azerbaijan, weather is expected to be dry. It will be intensive in some places. The temperature will be +3-8?C at night, +12-17?C in daytime, -2+3?C in mountains at night, +5-10?C in daytime. East wind will waft.